Infosys founder Narayana Murthy has pointed out yet another reason why IT isn’t the lucrative field it once was. “In the last seven years, the salaries of freshers in the software industry have stayed stagnant while the same for senior-level employees have grown by up to 1,000 per cent,” he said while speaking at a conference. Murthy termed the lack of pay hikes as worrisome. “If we believe in capitalism, if we believe that is the best solution for the country to move forward, then the leaders of capitalism will have to demonstrate self-restraints in apportioning to themselves the part of the benefits that come out of running companies,” he added. Murthy does have a point — IT freshers at Infosys earn a salary of Rs. 13,000 a month during their training period. After spending around a year with the company, Infosys engineers typically earn a take-home salary of Rs. 28,000-Rs 30,000 per month. This number hasn’t changed much in several years, but employee compensation for top executives has skyrocketed. Former Infosys CEO Vishal Sikka had a salary of Rs. 49 crore, or Rs. 4 crore a month. The wide disparity between CEO pay and the pay of the median worker isn’t limited to Infosys. At Infosys, the CEO earns 289 times the median employee, while at Wipro, the CEO makes 259 times the pay of the median employee. At fellow IT major TCS, the CEO makes an astonishing 515 times the salary of the median employee. 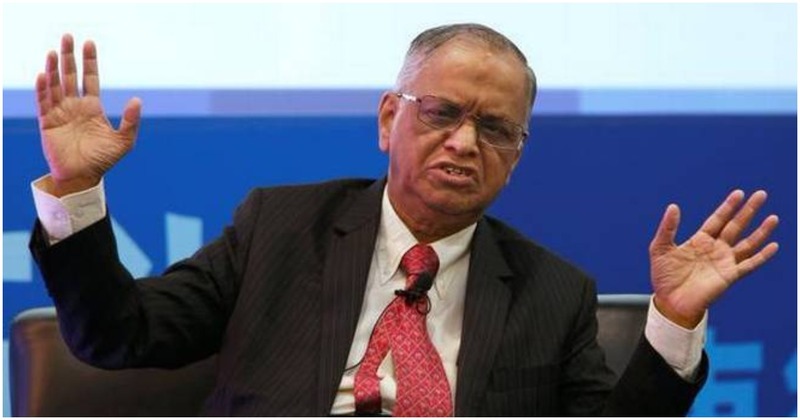 Murthy conceded that times were hard in the IT space, and urged business leaders to rein in their high salaries. “If all of us make sacrifices, then the youngsters will understand,” he said. The disparity in salaries among freshers and top execs, though, might come down to simple economics. Thanks to the engineering college boom that took place in the 1990s, the number of engineering seats has increased from 87,000 in 1990 to 16.28 lakh now, representing an 18x increase. This has ensured a steady supply of freshers for IT firms, which has meant that salaries have been typically low. The number of experienced IT executives, though, hasn’t increased anywhere the same range — the major firms only have a handful of top tier positions — leading to a shortage in supply, and hence much higher salaries. But the low salaries that IT freshers earn could end up hurting the sector in the long run. Engineers can now earn better salaries at startups and smaller companies, which means that top engineering talent isn’t joining IT giants any more. And while the impact of this this talent drain might not be immediately apparent, it could hurt the prospects of the sector in the decades to come.